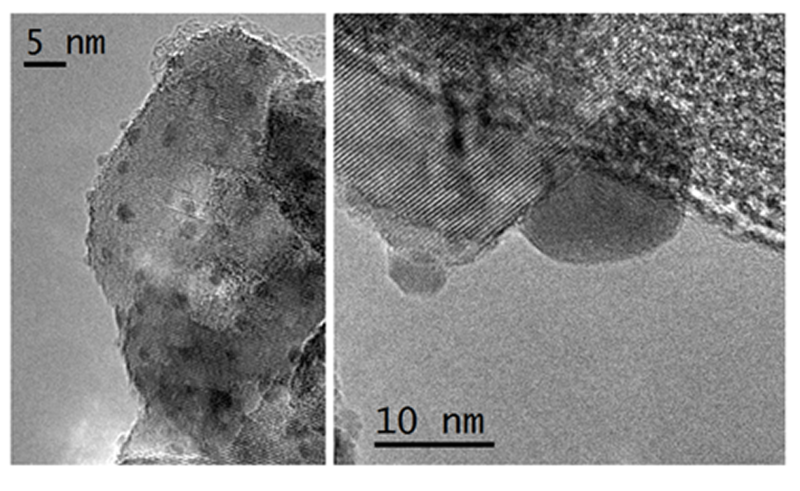 Figure caption: TEM images of a Ag-TiO2 photocatalytic compound. Improvements in the design and function of catalytic materials are crucial in solving a host of current problems including developing cleaner fuel technologies and removing environmentally harmful processes in the pharmaceutical or chemical industries. Porous materials consisting of organic linkers connected by metal ions provide framework scaffolds for heterogeneous catalysis, which is based on the organic, or inorganic components. Various techniques may be used to functionalize the former, or to create coordinatively unsaturated metal sites. One such family of materials, called meta-organic frameworks (MOFs), are of current interest in the department for C-H bond activation. We are interested in exploring the photocatalytic properties of metal oxide nanoparticles decorated with noble metal clusters which exhibit excellent oxidative properties upon illumination with UV or visible light. Our materials support chemical reactions that can degrade organic contaminants and other pollutants, as well as pathogens. Single-atom catalysts (SACs) offer the prospect of achieving rationally designed, well-defined and atom-efficient catalysts with active sites tuned for reaction selectivity, enabling many chemical conversions used in modern society to be achieved in a more efficient and ‘green’ manner. Realising the potential of SACs requires understanding their atomic-scale structure and chemistry, and the fundamental behaviours of single-atom engineered catalytic systems in physico-chemical terms. There is also some interest in the development of new magnetic materials to facilitate Otho-Para conversion of the gas and liquid hydrogen for long energy storage. Importance of the compositional and morphological development of the catalyst requires understanding at the atomic level magnetic interaction between molecules of hydrogen and magnetically tailored open surface of the catalyst. The advance in the development of heterogeneous catalysts, and particularly single-atom catalysts, is highly promising. However, realizing their potential requires a greater understanding of their atomic-scale structure and chemistry, and their fundamental behavior. We employ advanced electron microscopy techniques to probe structure and chemistry at the atomic level, using the knowledge gained to guide the development of even more efficient materials.